I tried for a sort of gender-neutral bunny, but this one came out looking pretty girlie. That's her choice! She's made of cotton yarn with a couple of fancy yarns added to the hair. I started with a pattern for the head and upper body, and went off-road from there. 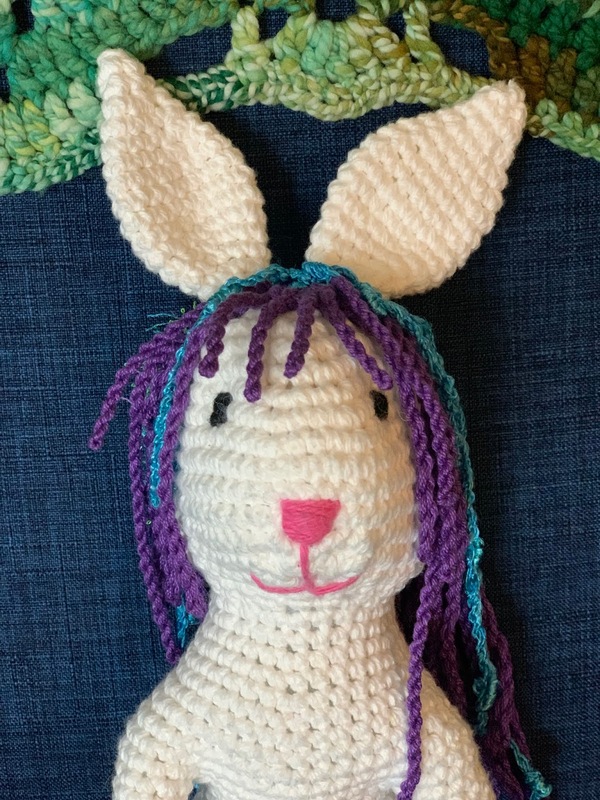 Find the pattern on Ravelry: Pixie The Rabbit, by StuffTheBunny. It was easy to follow, as long as I sat by myself and paid attention. Lots of counting, but not difficult. 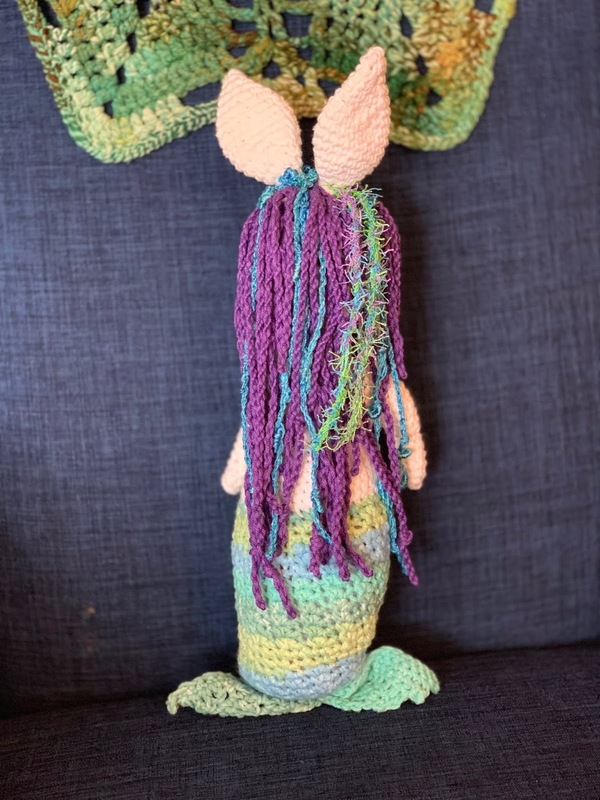 I also used a heavier yarn and larger hook than called for, so it came out sort of huge for an amigurumi. Not a problem! Big bunnies are best! If you do the same, don't bother making the ear holes at the top of the head... they'll come out way in the wrong place. The hair is fun to do. 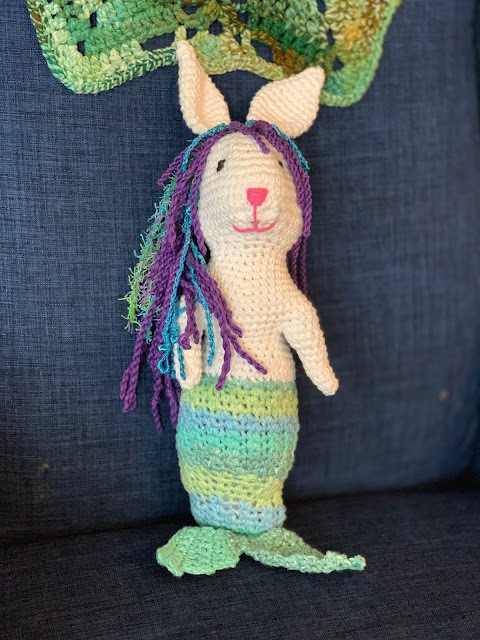 I came up with a way of making it strand by strand, twisting and doubling long stretches of yarn, and anchoring them with a slip stitch or single crochet. It's similar to making twisted fringe, which is also really fun to make for knit and crocheted shawls and scarves. I was planning to save it for an Easter surprise for the Little Guy, but I couldn't stop myself from showing it to him via FaceTime yesterday when he was feeling kind of grumpy. MerBunny got him giggling in a flash, so it was well worth ruining the surprise. Like an almost-one-year-old cares about surprises, right? Every minute of every day is a surprise when you're so new to the planet. I can't wait to tell him about narwhals.